While you've been working or otherwise occupied with the humdrum of your day-to-day, Rihanna's been in Washington, D.C., probably having a better time than most of us will experience in our entire lives. While a trip to our nation's capital might not seem like the most thrilling vacation a (bad)gal(riri) can take, this is Rihanna we're talking about and—as has been established by Julianne's Rihanna Rihport—the woman tends to bring the fun wherever she goes. 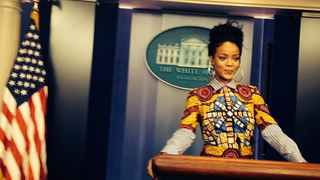 For example: During a visit to the White House, Rihanna posed in the Briefing Room and the West Wing and even indulged in a little Scandal role play at a pay phone outside the White House gates. This is even more exciting than my middle school trip to D.C. which, considering that 2001 8th grade power couple Jessica Smithe and Mike Fluery were rumored to have fingered each other on the bus on the way there, is really saying something.